$240. 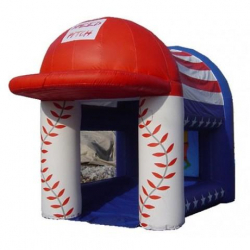 Our speed pitch inflatable shows how fast can you throw a baseball by use of a radar gun, you can see the speed in real time with each and every throw on our large digital display. Kids and adults will love our speed pitch inflatable and see who can throw some real heat as they say in baseball. Our Speed Pitch measures 14'Long x 8/'Wide x 11' High. Includes (1) 110V blower.